We are engaged in the industry for successfully handling the customer requirements by manufacturing and supplying aluminum shower chair. Owing to our experienced team, we design these systems with utmost care and precision. Further, their exclusive designs also make these appreciated among our clients. Weight Capacity: Upto 250 Lbs., 251 to 350 Lbs. Seat Width: Standard 17" to 19"
Size: 52 x 46 70 Cm Height. As a specialist in this domain, we are offering a wide range ofShower Chair. We are one of the conspicuous names in the industry for the inclusive range of Shower Chair for our valuable customers. Our range has 6"PVC Castor, 12"PU mag real wheel fixed armrest and folding footrest drop back handle with United break. Apart from this, we are offering these products at leading market rates. 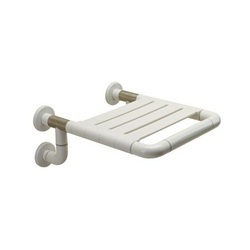 Description This plastic and aluminium bath bench is light-weight, height adjustable and comfortable to sit in. Ergonomically designed, it is curved for comfort and provides raised edges making getting up easy. The seat is made of durable, stain free, easily washable plastic with drain holes for easy flow of water. Light weight , anti skid legs, adjustable height with back support. Adjustable: 2.5cm / 1 inch increments. We have Chairs with great finishing and a-1 quality that we serve. 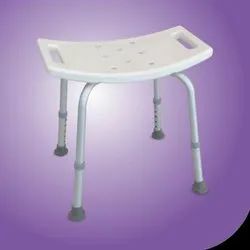 So as to understand the varying demands of our customers in the best possible manner, we have come up with an inclusive array of Folding Shower Stool Chairs.